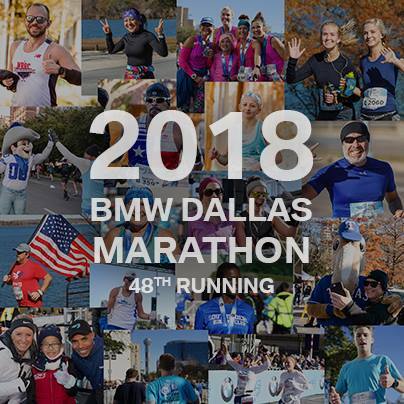 I am a Premier Protein trainer ambassador and a member of Dallas Fitness ambassadors. 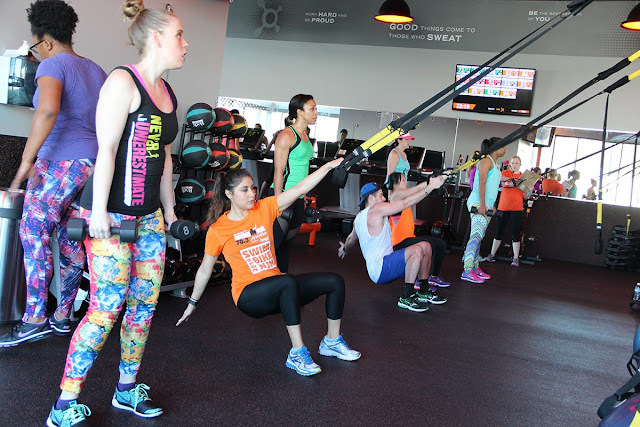 I attended an Orangetheory Fitness class for free as part of DFA event with Premier Protein. All opinions are my own. If I hated it, I'd tell you. Photos by Dallas Fitness Ambassadors. Warning: Cheesy orange jokes ahead. I experienced a hot new fitness trend this weekend. It involved rowing machines, the weight room and running intervals. Orange you glad I didn't say CrossFit? 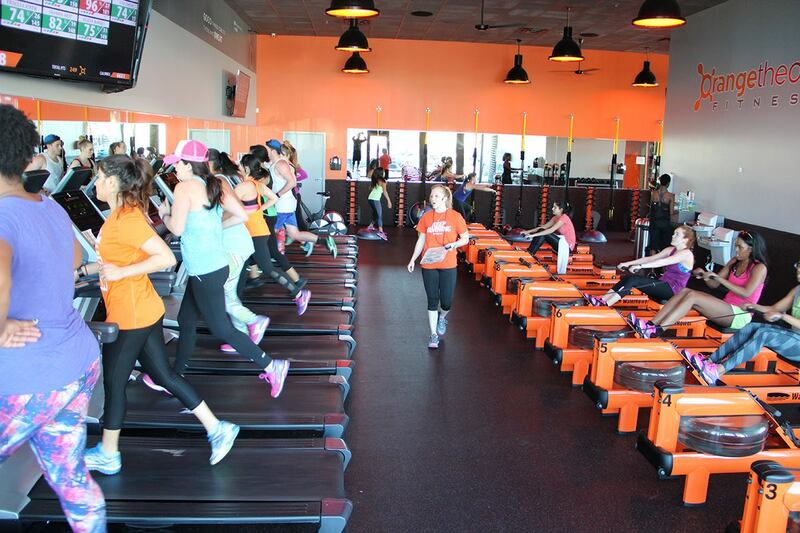 Move over CrossFit, Orangetheory is the newest fitness trend. High Intensity Interval Training is not exactly a new concept, but Orangetheory is putting their own twist on HIIT. The fitness world has been buzzing about this studio and I was thrilled (and sort of terrified) for the opportunity to give it a try. 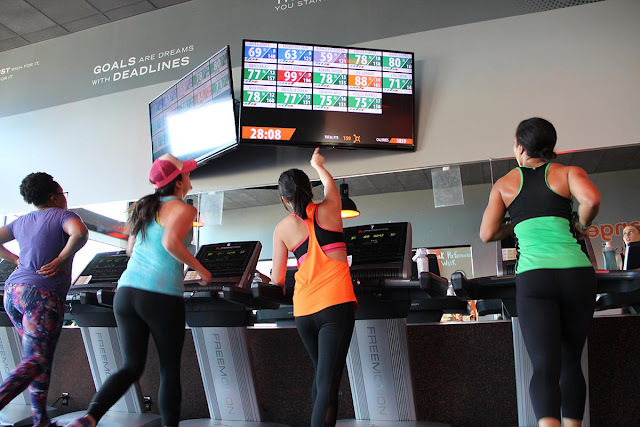 Orangetheory has more than 225 franchise locations including 33 studios right here in Texas. It seems like overnight they started popping up everywhere! 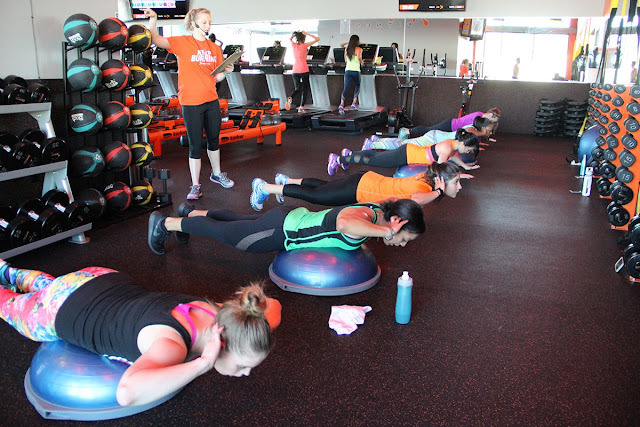 You can't throw an orange around here without hitting a new Orangetheory location. 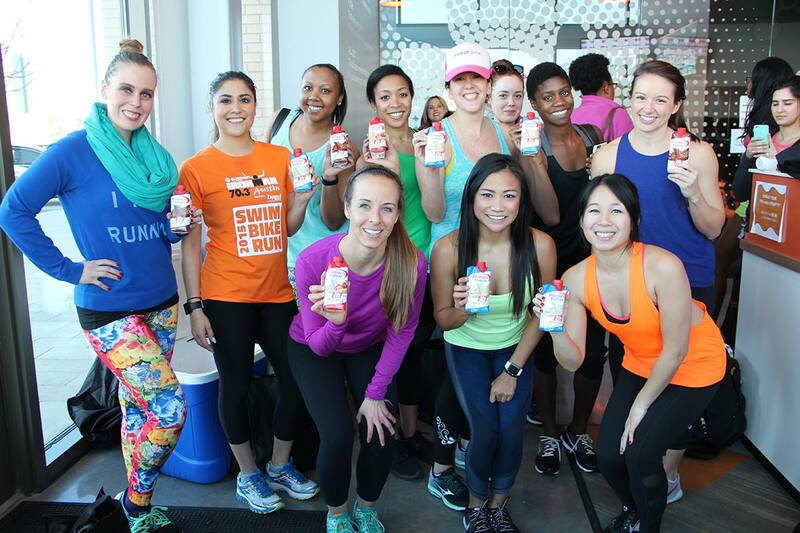 I attended a Dallas Fitness Ambassadors event at the Preston Hollow, Dallas location last Sunday. ShamiraFit and I showed up a couple of hours early as Premier Protein trainer ambassadors to hand out tasty protein bars and shakes to the classes all afternoon. As I watched the sweaty participants finish up their classes looking happy and exhausted, I started to get really excited about trying this class! I filled out a form before the workout, but it wasn't your typical "I promise not to sue you if I die" form. I answered all sorts of questions about my height, weight, birthday and fitness level. While filling out the form, I thought some of the questions were oddly specific until I realized they were asking most of the questions to get an estimate of my maximum heart rate. The classes are heart rate based and are designed so that your HR gets up to 84% of your maximum heart rate (the orange zone) for 12 to 20 minutes of the 60 minute session. Ahh. The orange zone. It all makes sense now. They issue you a heart rate monitor (that you can rent or buy) for the class. I strapped it on and my name and heart rate zone appeared on the TV screens around the studio. The class split into groups and I started on the treadmill because, you know, comfort zone. During the class we toggled between treadmills, rowing machines and the weight room. 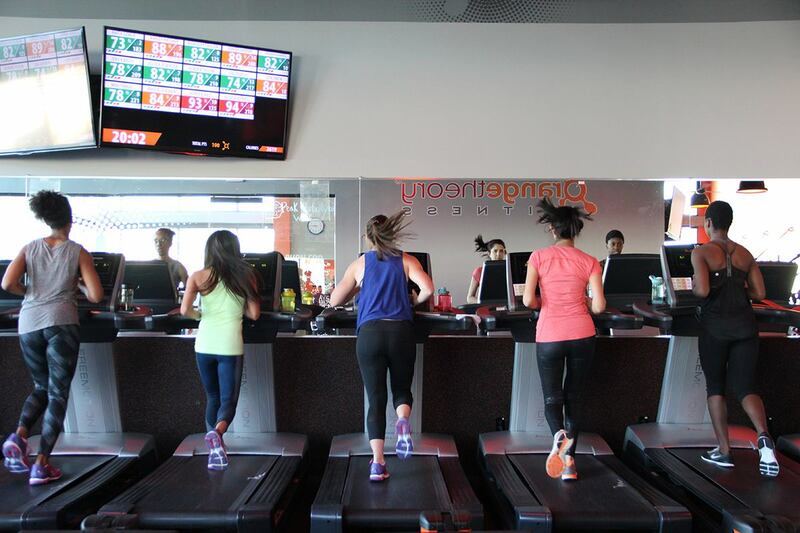 We started out with a warm up on the treadmill and followed the trainer's cues to change up our pace. There was a base phase, a push phase and an all-out phase that varied from 30 seconds to three minutes each. I love that you worked at your own level. One person's base pace may be another's push pace. You use your heart rate monitor as a guide. I sometimes had a little trouble hearing the instructor over the music and deciphering which of her cues were intended for my group and which ones for the other groups. I found myself (more than once) pushing when I was supposed to be in my base zone. The treadmill block seemed like it was over in a flash. We hit the rowing machines for 200 meters and then onto the weight room for a TRX strap and weight circuit. It all flew by so fast! We repeated the blocks in the second half of the class; back to the treadmills and rowing machine for round two before hitting the weight room for a BOSU ball circuit. Mai Lyn "Hey look, Lea. Your heart is exploding." When it is all over they recap your workout on the screen and send you an email with all the details from your session, including your estimated calorie burn and how many minutes you spent in the orange zone. 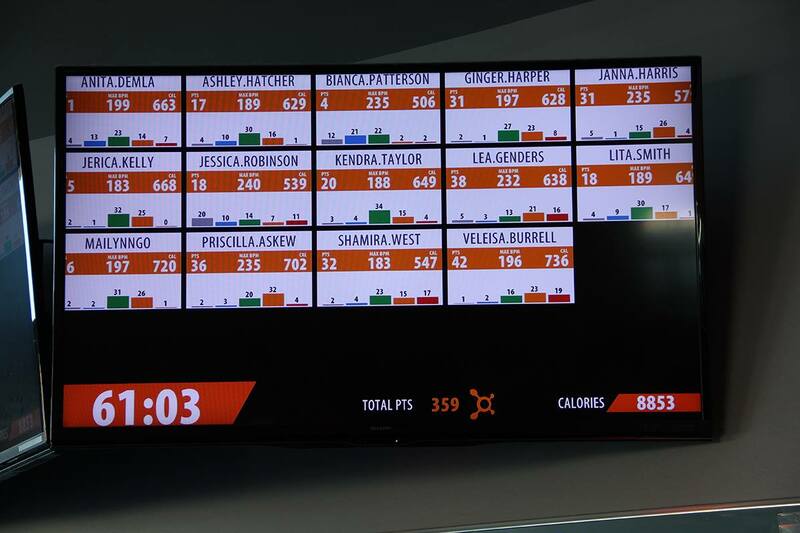 My Orangetheory Fitness class was really fun and I highly recommend it for a fast-paced interval style workout! I will be back and now that I know what to expect, I think I'll be able to follow the cues a little better next time. I love that it is a cardiovascular and a full body strength training workout in one fun hour. The group dynamic helped me push to my limits. It can be a perfect workout for someone with a busy schedule who wants to get the most bang for their workout buck. As a trainer I can tell you that high intensity interval training is a very effective workout as long as you allow time for your body to properly recover between sessions. I would recommend this type of workout two or three times a week with less-intense workouts or rest days between these effort sessions. After our class, my fellow ambassador Shamira and I gave the Dallas Fitness Ambassadors Premier Protein shakes and bars for a tasty post workout recovery snack and they were literally eating it up. Have you heard of Orangetheory? Have you ever tried it? Orange you glad I wrote this review? Leave your thoughts or your favorite cheesy orange joke in the comments! That sounds like a really good workout, but I don't think it's reached these shores yet..
haha. I know the feeling!